Jurors at the Hillsborough disaster trial have been told to "put aside their emotions and sympathies" during their deliberations. Beginning his summary of the case, Judge Sir Peter Openshaw said "the deaths of 96 spectators... is a profound human tragedy". He told jurors at Preston Crown Court to conduct an "objective and dispassionate review of the evidence". 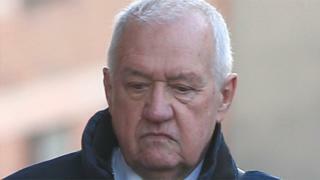 David Duckenfield, 74, denies the gross negligence manslaughter of 95 people. Mr Duckenfield was the match commander at the FA Cup semi-final on 15 April 1989, when 96 Liverpool fans were fatally crushed on the Leppings Lane terrace. Former Sheffield Wednesday secretary Graham Mackrell, 69, denies a health and safety offence related to the number of turnstiles allocated to Liverpool supporters for the match. Sir Peter said there had been times during the 10-week trial of heightened emotion and distress and reminded the jury not to be overawed by the interest in the case. He said the sadness and anger was for many people "as raw today as it was 30 years ago". "All that the community asks of you is to do your duty to deliver a true verdict according to the evidence." The judge reminded the jury about the historical context of football in the 1980s. "Games were played in a very different atmosphere," he said. "Hooliganism, sometimes fuelled by tribalism and heavy drinking, marred many games." He said the "design of the stadium and police planning had to take into account the real risk of crowd trouble". He reminded the jury of evidence about the planning for the match and said the South Yorkshire Police operational order made it clear Mr Duckenfield was in overall command on the day. He warned the jury not to draw any "adverse inference" from the fact that neither defendant gave evidence, which he said was their legal right. The court was adjourned until Friday, when the judge is expected to continue summing up.